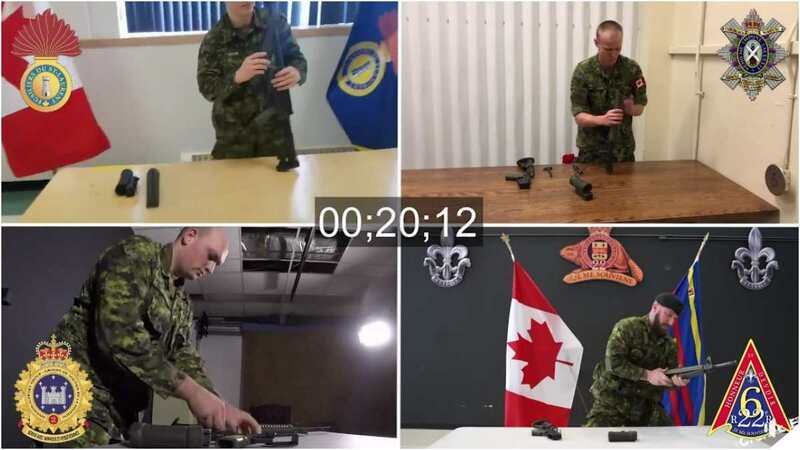 Over the past several weeks, soldiers of the Canadian Army have been talking smack and posting videos on just how fast they can field strip their C7 rifles. The gun, a variant of the M16A3 made by Colt Canada, is the country’s primary infantry rifle. In early February, a soldier of the Canadian Grenadier Guards threw the gauntlet down with a 47-second run, but many pointed out she didn’t do a function check and put the optic on backward at first. Les membres du CGG peuvent assembler une C7 en 47sec. Si votre régiment ne répond pas à ce défi, vous acceptez qu'ils sont les meilleurs. The Canadian Grenadier Guards is better than your unit at assembling a C7, make us change our mind. Then, a corporal of The Brockville Rifles came in at 42 seconds. This soldier from the 34th Combat Engineers Regiment seems to be pretty fast with a time of just under 34 seconds. However, in the four-way video below, a soldier with the Les Fusiliers du St-Laurent, a reserve unit in Quebec, pulls a time of under 30. Parmi ceux qui ont répondu à notre défi C7, quelle unité sera le plus rapide ? Among those who answered our C7 challenge, which unit will be the fastest? More on the C7A2 below, from a Colt Canada rep who is also a Canadian Forces reservist.